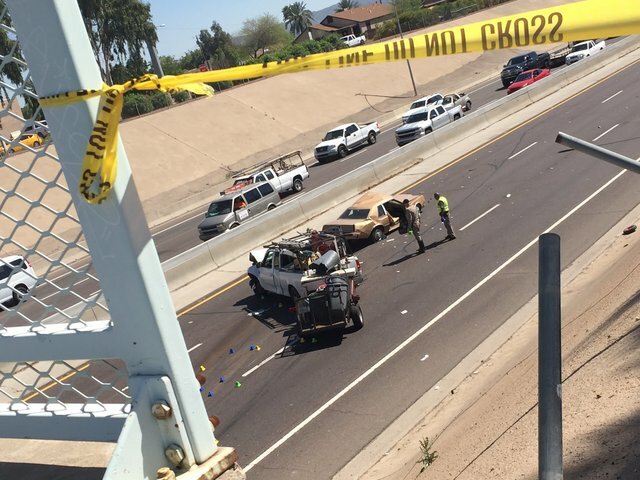 Phoenix, Arizona—Three people were seriously injured and one person was killed when a car plunged off an overpass in downtown Phoenix on Friday afternoon. A brown Chrysler driven by an as-yet-unidentified 65-year-old man was southbound on the 23rd Avenue frontage road that runs parallel to Interstate 17. Where I-17 passes under Grant Street, the middle lane of the frontage road allows vehicles to either continue traveling straight or turn left. According to Arizona Department of Public Safety accident investigators, the semi-truck in the middle lane turned left, while the driver of the Chrysler in the inside lane decided, at the last moment, to go straight. As a result, the semi-truck pushed the Chrysler off the overpass onto the freeway below. The driver was killed instantly, while his passenger is hospitalized in critical condition. The Chrysler, then, was struck by a pickup truck, seriously injuring the two occupants of the truck. It was hit again by two other vehicles. We extend our condolences to the deceased victim's family and friends over this tragic loss, and we wish those who were injured swift and complete recoveries.